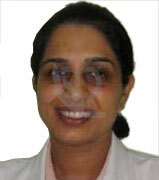 Dr Daljeet Kaur, MBBS, MD(Dermatalogy), is a Consultant in the Department of Dermatology at Fortis Hospital, Mohali. Dr Daljeet has done her graduation and post-graduation (MD) in Dermatology from the famous Dayanand Medical College, Ludhiana, followed by her senior residency in the same Hospital. To her credits, Dr. Daljeet has conducted a number of Clinical Drug Trials for the drug related problems in the field of Dermatology. She is also actively involved in promoting healthy skin awareness by writing articles and advisories.